How can we think of information and meaning in relation to the shared histories of document and documentary? 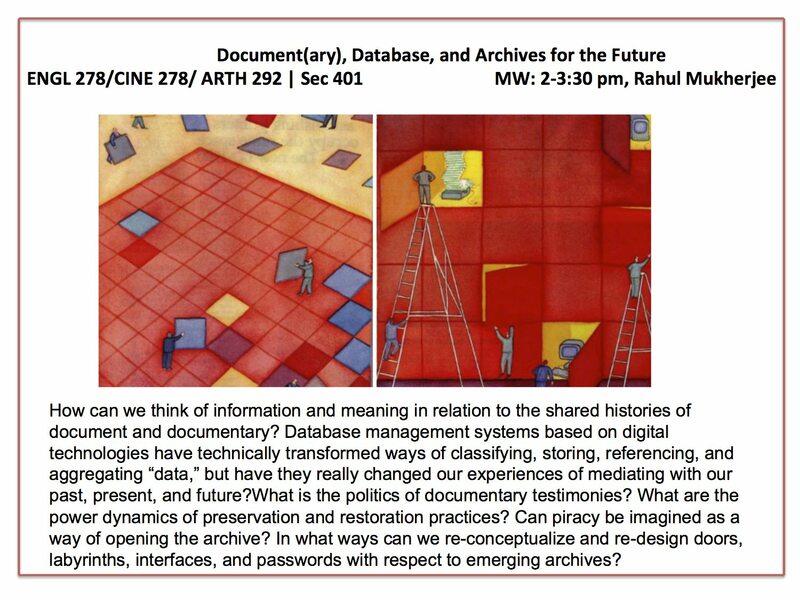 Database management systems based on digital technologies have technically transformed ways of classifying, storing, referencing, and aggregating data, but have they really changed our experiences of mediating with our past, present, and future? What is the politics of documentary testimonies? How are database documentaries produced? What are the power dynamics of preservation and restoration practices? Can piracy be imagined as a way of opening the archive? How green is cloud computing and why is that important for the future of archives? In what ways can we re-conceptualize and re-design doors, labyrinths, interfaces, and passwords with respect to emerging archives? This course would especially be of interest for students working at the intersections of media, technology, and society. Assignments include one assigned/selected report from field visits to libraries and museums and a final paper or practice-based art project.